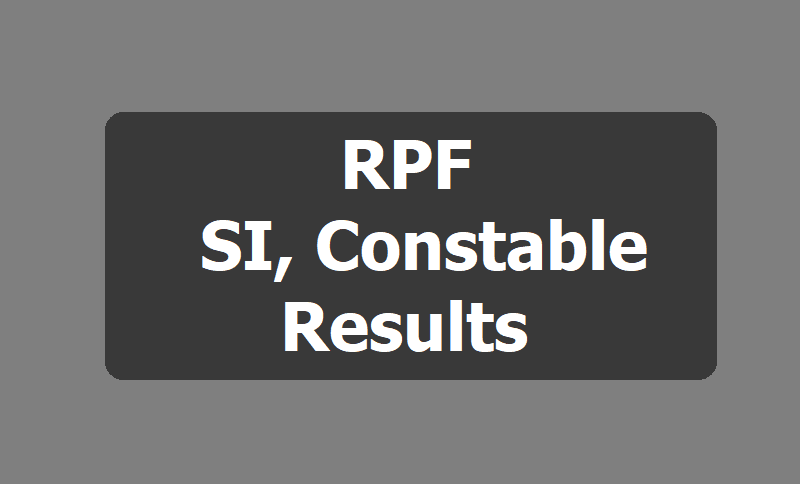 RPF SI, Constable Results 2019 for RPF Group A, B. C and D Posts The Railway Protection Force (RPF) and Railway Protection Special Force (RPSF) have declared the results and merit list for a number of posts, including Group E (Constable and Sub Inspector) and Group F (Sub Inspector) for Physical Efficiency Test (PET) & Physical Measurement Test (PMT) and Document Verification (DV) on its official website on February 05, 2019. RPF has uploaded the list of candidates qualified for the Group A, B, and Group F 1st round of PET, PMT and DV. Candidates can check the list from official website. Railway Protection Force (RPF) has uploaded the list of candidates qualified for the Group A, Group B, and Group F 1st round of PET, PMT, and DV on its official website rpfonlinereg.org. Candidates who have cleared the written exam will have to appear for the Physical efficiency test, physical measurement test and document verification to make it to the final selection. RPF has also released the list of shortlisted candidates for Group A, B, E, F and 2nd round of Group E, PET, PMT, DV on the website. The PET, PMT, DV is expected? to be conducted in the first week of April. A total number of 2420 candidates have been selected for the second round of PET and PMT. RPF Constable 2018 result: How to check? Step 3: Or click on candidates shortlisted for PMT, PET,?DV?2nd round for Group F.
Step 4: Alternatively, click on this direct link to access the result page. Step 5: Click on the relevant group to access the list of candidates shortlisted. Step 6: The list will open and candidates can check their names from the list. RPF SI Result 2018 declared and candidates Check list qualified for PET, PMT AND DV. The Railway Protection Force (RPF) has released RPF Sub-Inspector recruitment examination result 2018-2019 for all Groups. The RPF has conducted the Computer-based test (CBT) for recruitment of candidates for the posts of Group A, B, C, and D.
The candidates who appeared for the CBT Test can visit the official website of the RPF to check their name on the merit list. The RPF SI Result 2019 is available in a PDF format with details of candidates shortlisted for PET, PMT, and DV. The candidates who qualified the CBT exam will now have to appear for physical examination test, physical medical test and document verification process. The PET and PMT for shortlisted candidates of Group A would be held on March 19, and 20. For Group B, the tests will be conducted from March 24-25, and for Group C, the tests will be organised from March 23-25, 2019. The Group D candidates will have to appear for the tests from March 24-25, and for Group E and F, the test would be held in the last week of February 2019. Currently, call letter download link has been activated for only Group A. For rest, call letter links will be released later. Railway Protection Force, RPF & Railway Protection Special Force, RPSF has released Constable result for Group E. Candidates who have appeared in the written examination can check their results through the official site of RPF at rpfonlinereg.org. A total of 2084 candidates are selected to appear for next round of tests. Candidates who have qualified the written examination will have to appear for Physical Efficiency Test (PET), Physical Measurement Test (PMT) and Document Verification (DV). The tentative date of PET, PMT and DV is last week of February. RPF Constable Result 2019: Firstly Visit the official site at rpfonlinereg.org. Click on Constable posts. A new page will open where candidates will have to click on candidates shortlisted for PMT, PET and DV. A pdf file will open, check the results and save it for further need. The examination will fill up 8619 posts of Constable in the force. The examination was computer-based test. Candidates who want to check for more information can visit the official site of RPF for details. Number of students appeared: A total of 3153 candidates have been shortlisted in the Computer Based Exam (CBT) exam out of which 2,084 in RPF Constable Group E Posts, 424 in RPF SI Group E Posts and 645 RPF SI Group F Posts have cleared. Those who have made it to the merit list may now undergo for Physical Efficiency Test (PET) & Physical Measurement Test (PMT) and Document Verification (DV). The test would be conducted in the last week of February 2019. Step 1: Go to official website for RPF recruitment. Step 2: Click on the 'Candidates shortlisted for PMT, PET, and DV' link on the home page. Step 3: In the new window, click on your corresponding Group. Step 4: A pdf will open. The pdf contains the names and roll numbers of candidates who have been shortlisted for further rounds of selection. Check for your name and roll number in the pdf. The written exam for recruitment for group E exam was conducted from December 20 to December 23, 2018. The PST exam will be conducted in last week of February. Admit cards and exact exam date and venue will be released by the RPF soon.